Our aim is to wholesale to retailers locally and throughout Ireland. Our team will try to maximize in producing high quality trees and grade our plantation according to quality. This will give customers a choice when selecting Christmas trees for their market. Whats Available For Wholesale 2018? 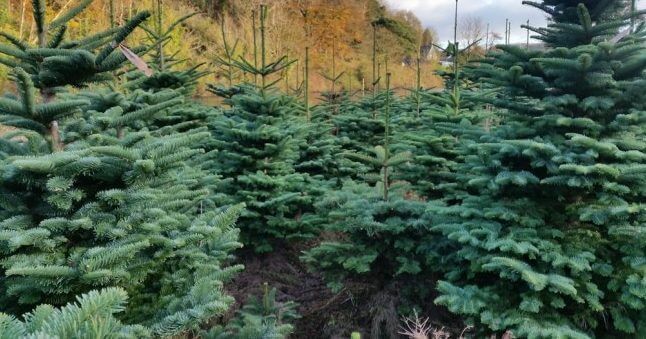 Our Christmas trees for sale are available and from 4 ft to 10 ft in Noble fir and Nordmann fir. We encourage customers to make contact with us by the end of August. By this stage our plantation will be finished the growth season and we will be selecting and grading trees available for wholesale. When you are happy to make an order a 25% deposit may be required to secure the purchase. In April when frost is no longer present we begin planting. Before we start, the area to be planted must be ploughed, rotivated and checked for any run off of water which affects the soil and growth of Christmas trees. Each tree specimen is then planted carefully and without damaging the roots in the process. At the end of April after completing planting we then spread fertiliser effectively by hand. During the summer months our team will then take care of growth control, pruning and shearing to meet our clients needs. By the end of August we can then start grading trees according to quality and size. By the end of November / start of December we begin harvesting for wholesale clients. Our team will also net the trees carefully if requested. We will then load for transportation and ready for the selling season.